How often do you use your Smartphone? Or, shall we ask how often do you keep your Smartphones away from you? As a matter of fact, at least for techies, we guess the second question would be more easy to answer than the former. Its reason is quite simple; for both techies and non-techies, Smartphones have become somewhat one of ‘essential’ gadgets for life. Don’t worry, rest of the world is not different from you either! To prove how smartphones have changed their identity in World’s day-to-day life, we have some interesting graphics to show you! In these posters, you can also have glimpse on future of global smartphone market as well as how users use their smartphones to make their life ‘smart’. Asia, being largest continent, has ensured their first place in number of smartphone subscriptions as well! 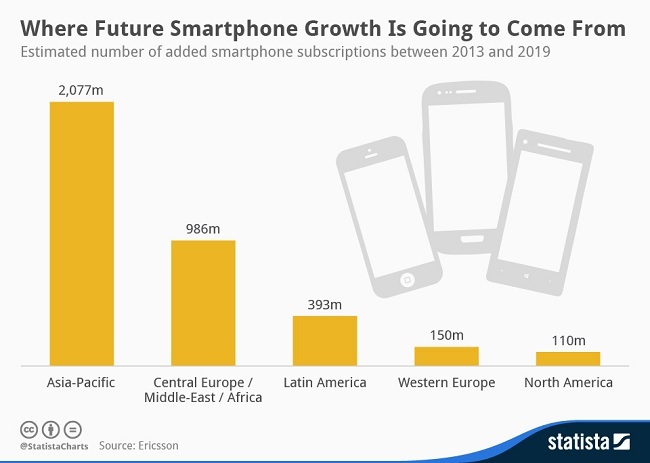 Yes, according to statistics, Asia will have around 2077 million smartphone subscriptions between 2013 and 2019. Central Europe, Middle East and Africa has the second place with a number of subscriptions of 986 million, and North Americans have made only 110 million. It does also mean that countries in Asian continent, most of which are still in path of development, has accepted Smartphones massively. Obviously, these numbers are damn high when compared with those of past years. Plus, it should be noted that experts expect number of subscriptions to reach 5.6 billion by 2019. And, we are sure that their expectation will not go wrong. Unlike most of you might think, phablets — common name for Smartphones with BIG screen — have great role in increasing number of smartphone subscriptions, at least in case of Q1 2014. Fact has it that one-third of total number of smartphone subscription is done by phablet devices, which have screen size of more than 5 inches! We think community of businessmen have done a good contribution to this! And, now you know the reason why most Smartphone manufacturers, including Apple, have an inclination towards big-screen devices, nowadays. In a recent presentation, Apple Inc revealed something that it DOES NOT HAVE what most of users want! In the total smartphone sales of 228 million, 159 million were smartphones with a budget less than $300. Devices that have screen size of 4 inches or more and price more than $300 made contribution of 91 million.And, number of sales for rest of devices was decreased by 22 million! 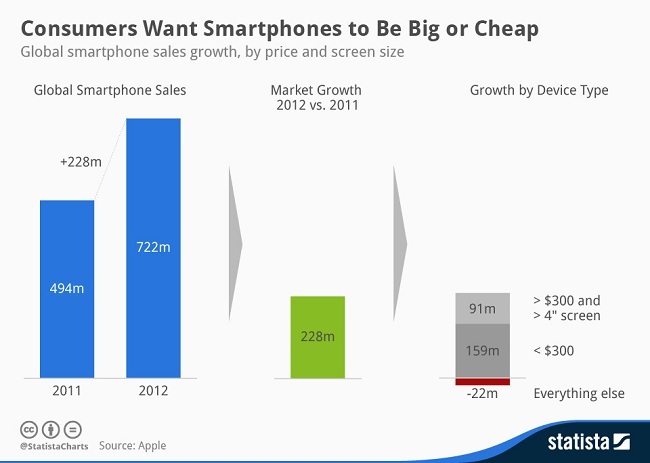 Thus, we have to conclude that the most loved traits of Smartphone are small budget and bigger screen size. Because of the same fact, we can expect more and more big-sized smartphones soon in the market. 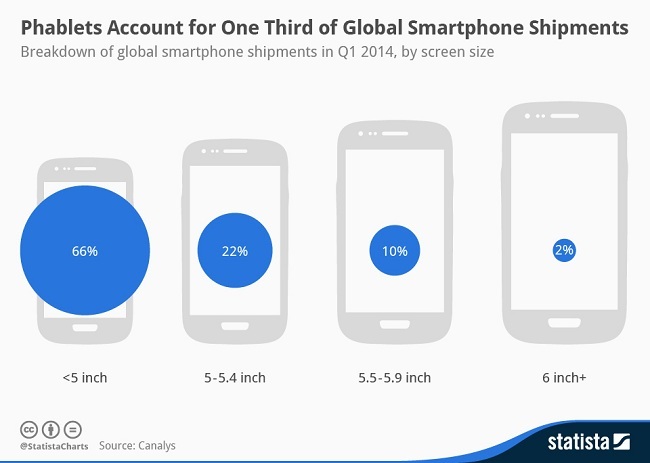 Affection towards big-screen smartphones is present in global level as well. Stats show that global shipments of devices that have screen size of five inches or more has a noticeable growth in past years. In 2012, number of shipments was 25.6 million, but it became 60.4 million in 2013. Also, the number is expected to hit around 146 million as we reach 2016. Even though fight among smartphone platforms are is still high, Android seems to dominate in smartphone industry, while Apple iOS is expected to have a stable growth in market. As we take a look into statistics, we can see that market share of Android is 78.9% as of 2014 (forecast), which is quite high when compared to that of 2012. 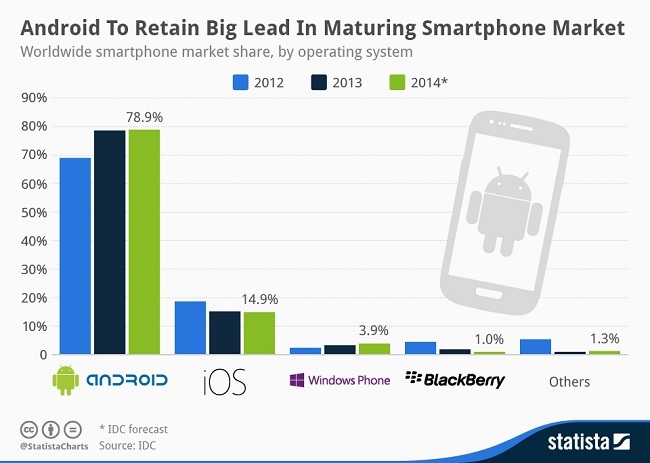 Experts say that this trend will continue, and Android will have its same place! Here is good news for everyone, but not for those who are from North America. 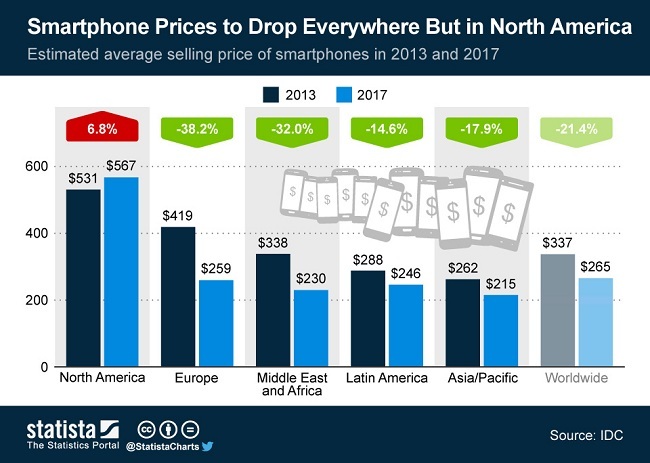 According to information from IDC, average selling price of smartphones will have a change from $337 to $265 by 2017. In Asia, the change is $262 to $215. Yet, North America is expected to have higher rates of around $567 by 2017 and it is an increase of 6.8%. Push notification is a great feature of smartphones, indeed. 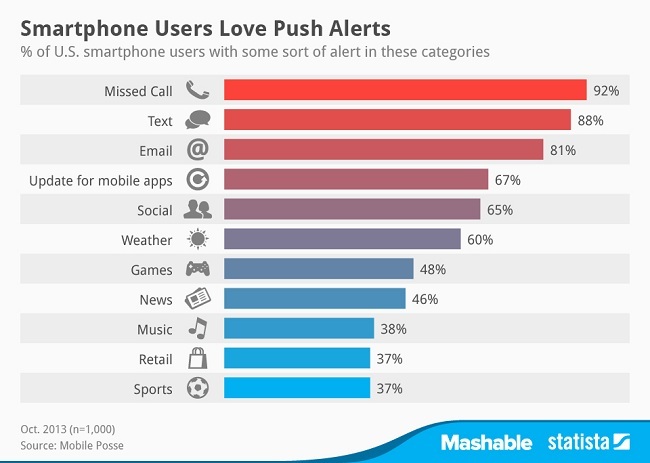 Do you want to know, which type of push alerts are used by most of Smartphone users? The above graphic will show you. As you can see, 88% is interested in listening to their mailbox, whereas only 65% loves to receive alerts when something happens in social media! It should be noted that these statistics are based on US users, and it may (and it will) be different in other countries. So, we hope these graphics are persuasive enough to tell you what is happening as well as what will possibly happen in world of Smartphones. It seems that we can see a slowdown of smartphone rates as well as launches of new smartphones with bigger screens and features. Undoubtedly, unless there is an apocalypse, we do not see a possibility of slowdown of smartphone subscriptions soon. So, go on with your ‘Smart’ endeavours, folks! A new world is awaiting you.